The Professional Visits for registered conference participants at the IASA 2018 conference will take place on the afternoon of Wednesday, 3rd October, 2018. Buses will be provided for transport. All tours start and end at the Parking Lot in front of the Department of Economics, University of Ghana, Legon. PV1- Sankofa - Ghana University campus including visits to two unique units including a special collections archive. PV2 - Nsaa - combined visit to two television stations. 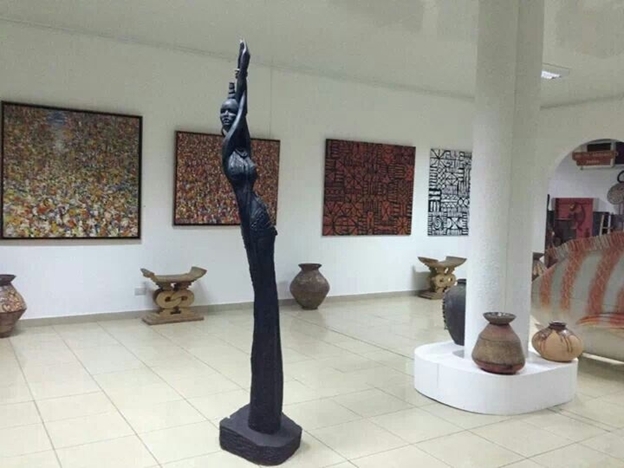 PV3 - Akoma - combined visit to two galleries and one museum. Details of each visit, which must be booked during registration, are given below. Costs of the visits including transportation are included in the conference registration fee. PV1 – Sankofa : T our of the host institution’s campus plus visits to two unique units including a special collections archive within the University of Ghana. Depart at 2p.m., return by 5.30pm. 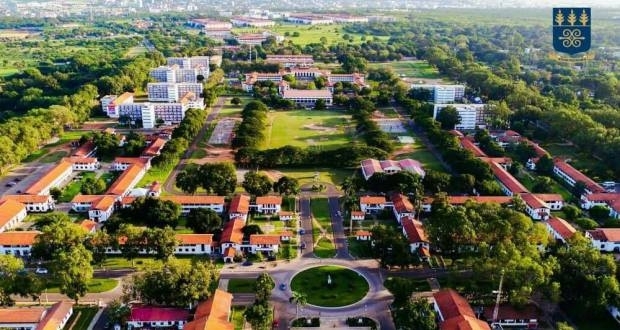 The University of Ghana, the premier university and the largest university in Ghana was founded as the University College of the Gold Coast by Ordinance on August 11, 1948 for the purpose of providing and promoting university education, learning and research. It has one of the most beautiful campuses in the country. IASA’s Sankofa Group will take a brief tour of the University’s campus. The next place of visit for the Sankofa Group is The Balme Library. It is the main library of the University of Ghana and was established in 1948. The central location of the Balme Library, its facilities and the scope of coverage of the collection make it a very important and vital part of academic life on the campus. 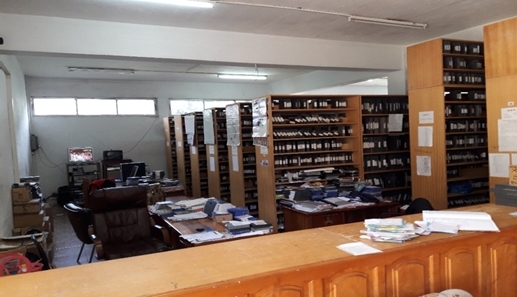 The University of Ghana Library System (UGLS) comprises the Balme Library and other libraries in the various Schools, Institutes, Departments, Halls of Residence and the Accra City Campus. The collection of UGLS which consists of both electronic, audiovisual and print resources provides essential background reading and reference for the courses taught in the University of Ghana. 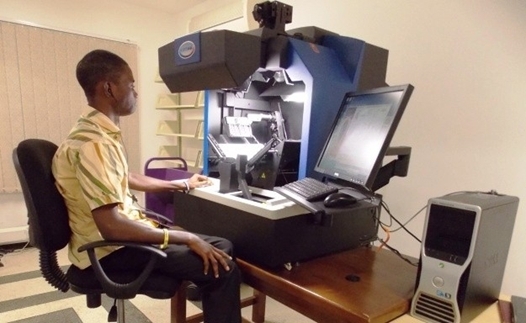 Highlights of the tour include: Africana Collection: Microfilm/Preservation Rooms and Digitization facilities. The Sankofa Group’s second professional visit for the day is The J. H. Kwabena Nketia Archives. It serves as one of the academic resource units of the Institute of African Studies (IAS), and contributes to the research and teaching activities of the six units within the Institute (Music and Dance, Language and Literature, History and Politics, Media and Visual Arts, Societies and Cultures, Religion and Philosophy). 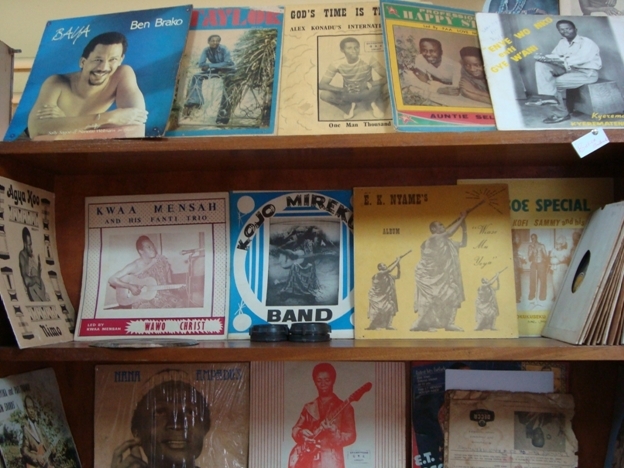 The archive’s contents includes music from all over Africa and particular Ghana, priceless recordings of already vanishing traditions as well as large samples of more recent popular music. 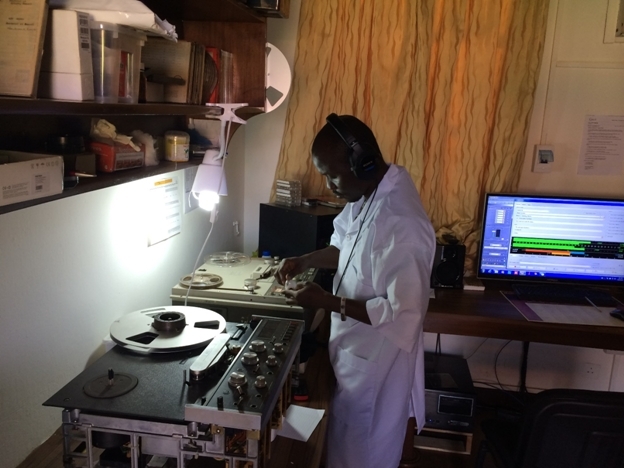 One of the key things that make the archive unique is that the earliest recordings by J. H. Kwabena Nketia in the early 1950s are the largest and most systematic set of recordings from an African ethnomusicologist, spanning forty years of field research. 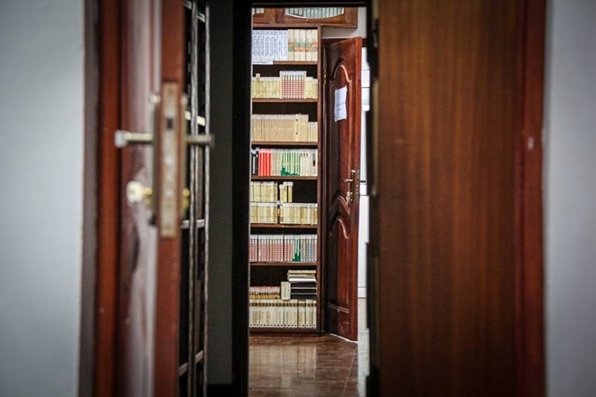 The collection has been expanded with the inclusion of the Institute’s historical records (administrative records and Arabic/Ajami manuscripts), dating as far back as the 1960s. The Archive serves a diverse community of users from the University of Ghana and beyond: the IAS students and fellows, students and lecturers in performance studies from the school of Performing Arts, researchers in ethnomusicology and related disciplines from within and outside the country; traditional authorities, record creators, the media, teacher training college students and tutors, music enthusiasts etc. Tour highlights include an audio digitization workstation, audiovisual collections storage and workflows for born-digital materials. PV2: Nsaa - Combined visit to two television stations. Start at 2.00p.m and return by 6.00 pm. Broadcasting began in Ghana on July 31, 1935 from a wired relay station opened in Accra. The brain behind the introduction of broadcasting into the country was the then Governor of the Gold Coast, Sir Arnold Hodson, affectionately known as the "Sunshine Governor". The broadcasting service was originally known as the Gold Coast Broadcasting System, before it was renamed the Ghana Broadcasting Corporation (GBC) upon the country's independence in 1957. Throughout its history it has been independent of the government's Information Services Department. GBC operates GTV (a channel for events that matter most to Ghanaians), which is broadcast nationwide on analogue terrestrial platform. 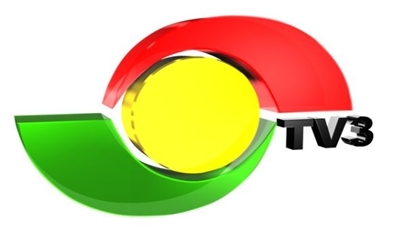 Additionally, GBC runs five (5) digital channels, namely: GTV Sports+ (a channel for sports), GBC 24 (a 24-hour news TV channel) and GTV Life (a religion and culture channel), GTV Govern (a governance channel), Obonu TV (a channel for the people of Greater Accra and window for the Ga-Dangbe) and ten (10) Regional radio stations, five (5) District radio stations in Ghana. 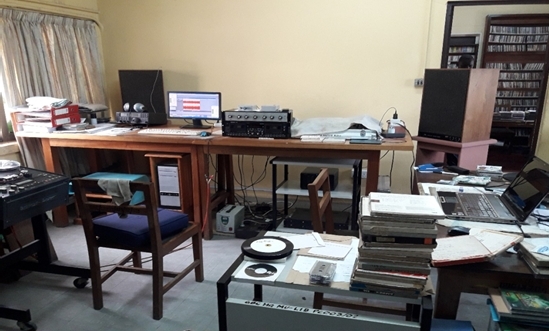 The Gramophone Library of GBC, also known as the “Gram Library”, has the largest collection of recorded music in Ghana and one of the largest archival collections in Africa. 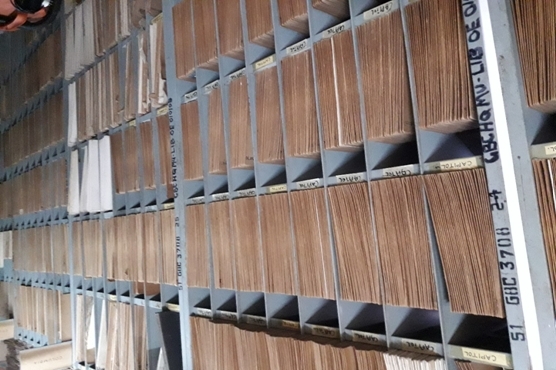 It contains thousands of gramophone records from local, foreign, and international recording companies, dating back to the 1940s, as well as vinyl records, cassettes, and Compact Discs. Apart from music, it also holds sound recordings (acetate records) of political speeches from the time prior to and after Ghana’s Independence. The Film and Video Library of GBC, set up in July 1965, is where all programmes—dramas, tv commercials, and ceremonial events—are kept. The Library holds the largest collection of audiovisual heritage materials in the country. TV3 Network Limited is a private free-to-air television broadcaster. The company began on air transmission on October 1, 1997 and produces a variety of television programs including news, drama, reality and entertainment shows. It its tag line, ‘First in News, Best in Entertainment’, TV3 Ghana established itself as the most watched free-to-air television station in Ghana, having achieved 65% nationwide penetration at the end of 2006. TV3 began transmission with initial coverage in the Greater Accra Region, parts of Central, Eastern and Lower Volta. TV 3 coverage is now nationwide in all parts of Ghana. Highlights of the tour include the media storage area, and transmission rooms. PV3: Akoma - combined visit to two galleries and one museum. Start at 2.00p.m return by 7.00pm. The hugely respected Ghanaian artist Ablade Glover established this renowned arts venue, which has become one of the most important of its kind in Ghana. There are three expansive floors of art displayed in cool marble galleries. Some are by established artists, such as Owusu Ankomah and George Hughes, whose paintings are reminiscent of Jean Michel Basquiat and Willem De Kooning, while others are by new and upcoming artists like Ebenezer Borlabie. Market, rural and urban scenes are interspersed with political satires – and naturally, there are also the shrouded figures and staccato crowd scenes by Glover himself. There are collectors’ pieces too: Asafo flags with appliquéd and embroidered symbols; ancient strip-woven Kente cloths by the Akan and Ewe; African masks of the type that inspired Picasso; and intricately carved furniture. Also on show are full-sized coffins in the shapes of crabs, running shoes and eagles. IASA’s Akoma group will take a quick tour of the gallery. The Centre For National Culture in Accra, Ghana, is better known simply as “The Arts Center”. It is situated right next to the Kwame Nkrumah Memorial Park, where the Kwame Nkrumah Museum is. There you will find what is virtually the tourist heaven of Ghana. 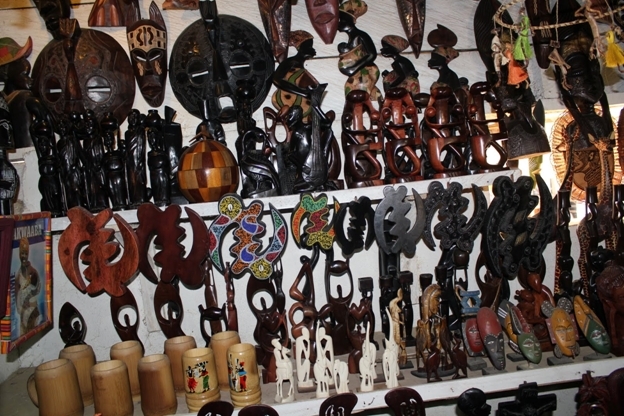 It has got everything from woven Kente cloth, wooden sculptures, earrings and other fashion accessories, the latest in African Attire fashion and arts and crafts from all over Ghana. There is so much to see that you will literally hyperventilate when you get there. There is a never-ending array of goods in numerous stalls that you may not even be able to shop, try outfits and haggle in only one day. There are some pictures of jazz bands, some of Adinkra symbols and some of mothers carrying babies on their backs. 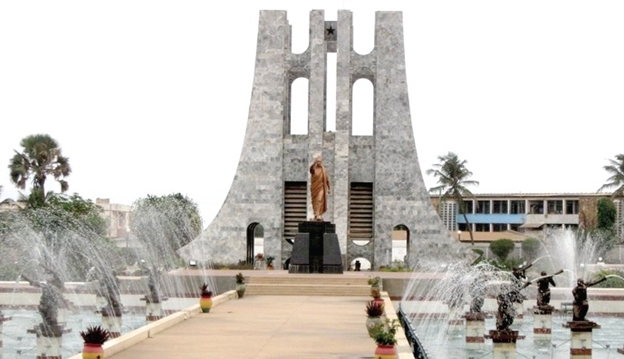 The Kwame Nkrumah Mausoleum and memorial park is located in downtown Accra, the capital of Ghana. It is dedicated to the prominent Ghanaian leader Kwame Nkrumah. The mausoleum, designed by Don Arthur, houses the body of Dr Kwame Nkrumah and his wife Fathia Nkrumah. It is meant to represent an upside down sword which in the Akan culture is a symbol of peace. The mausoleum is clad from top to bottom with Italian marble, with a black star at its apex to symbolize unity. The interior of the Mausoleum boasts marble flooring and a grave marker surrounded by river washed rocks. It has a total surface area of approximately 5.3 acres. The mausoleum provides a front for the statue of Nkrumah whereas the museum is subterranean and does not compete with the mausoleum for attention. Rhythm, contrast and harmony were the main principles of design used in this building. The Mausoleum is surrounded by water which is a symbol of life. Its presence conveys a sense of immortality for the name Nkrumah. It shows that even in death he lives on in the hearts and minds of generations here and generations yet to come.